To call this a film would not really be accurate. Its more of a series of sketches that are intertwined. That’s not a bad thing it fits the format that is laid out. It centers around the game show called Live or Die. 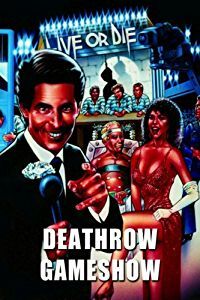 The premise of this show is Death Row Prisoners get a chance to compete and win prizes, sometimes for their family and provide entertainment before being killed on camera. For instance if a prisoner who is about to die via Guillotine has his head land face up his family wins a nice cash prize. The show is high rated and even though it has lines of protesters who constantly harass host Chuck Toedan its high rated. Unfortunately one day one of the contestants end up being the head of the Spumoni crime family. His death does not bode will with the rest of the family and they hire the best hit man in the world, Beano Agundez to take out Chuck Toedan. He has no problems taking this hit as his mother once wandered onto the set of the game show in a striped shirt and was forced to play and be killed as he shirt had everyone convinced she was a prisoner. As all this is happening we also meet Gloria a spokesman for the group “Woman Against Anything Men Are For!” she disapproves of the show and confronts him on a daytime talk show discussing it. She goes to his office for a meeting just as Bean Agundez shows up to whack Toedan. I love this film, always have always will. Like I said it’s a series of skits which work as its set in the realm of television. Its considered a horror film due to the general content, and the fact people are being killed for entertainment, but its very much a wacky comedy in my opinion. It has slapstick humor very reminiscent of a Zucker Brother film. The murders are all over the top hysterical, even the announcer who talks before the killings, always says something very un-pc yet hysterical non the less. The acting is good, as are all the practical effects. As it is paced out like a sketch show it moves along at a breathtaking pace never once slowing down. Everything hits you and you only get a few seconds before the next cut. If you had cable tv in the 80s this played from time to time late at night. It had an old VHS release but now the negative found its way into the hands of the fine folks a Vinegar Syndrome. And as you can imagine it looks great. Overall any fan of satire, horror, game shows, basically any fan of movies and tv in general need to go out and pick this up. It’s a blast from beginning to end and worth every penny.